I know many people don't like Miley Cyrus, but I do. I like that she is okay in her own skin and is aware of injustice in the world and speaks her mind for what she thinks is right. She gets silly and has fun. I say good for her! I was happy to see her host the MTV Video Music Awards. Plus, I love unicorns, rainbows, and glitter! Now let's get some music on here to get our week started! Here's Macklemore and Ryan Lewis with Downtown. I think this song will soon be everywhere especially with that awesome performance on the VMAs! I originally created this list back in 2010 from a writing prompt as part of another post. It's funny to me to see how much has changed, but even more so, to see how much is still the same. The phone I was using at the time had a sliding keyboard on it and my baby girl had just turned 16 and was really struggling in school. Now, of course, my phone is touch screen, my oldest has a B.A. in Psychology, my youngest is a licensed massage therapist, and I still love them like crazy! I would still hand out all these roses. Who or what would you give a rose to? The other day someone told me that she went to the hospital for one thing and they told her she was pregnant. When they told her the news she responded,"You must have checked the wrong uterus! I can't be pregnant." Why was it such a surprise? She already has kids so you would think by now she would've figured out how it happens. But, for many people pregnancy is a surprise. They aren't thinking about getting pregnant, they're just enjoying the intimate time with their partner and Bam! Pregnant! So, why does it happen so easily for some while others seem to be trying so hard to get pregnant and just can't? Well, for many it is a matter of stress. Stress takes a huge toll on the body and reduces the likelihood of conceiving. While reducing your stress isn't a guarantee of getting pregnant, it is a great place to start. Here's my best tips to reduce stress while trying to get pregnant to increase your odds of conceiving. Yesterday was the first day of school, but not in our house. This was the first time since 1998 that we didn't have all the excitement of back to school day. There was no buying new supplies, no figuring out what to wear, no excitement at the end of the day with all the details of the new friends in class. None of it; it was just another day. sigh. So, no back to school pics, but...Red Velvet Pancakes! Mmmmm Who needs school projects and fundraisers anyway?! When I went to New York City last month, I got to go see Blue Man Group. The show was tons of fun! It was so much fun that I think everyone should go to a Blue Man Group show. While I can't send everyone, I can send 1 person plus 3 of their friends with this giveaway. 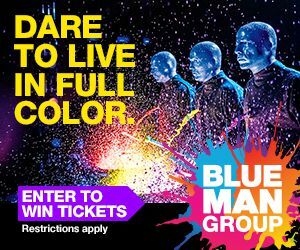 Read on to find out how you can enter to win 4 tickets to Blue Man Group. This Sunday is the 10 year anniversary of the Hurricane Katrina disaster. Hurricane Katrina left 600,000 pets deceased or homeless. In fact,many of the people that didn't evacuate stayed because they didn't know what to do with their pets. If you love your pets like I do, the last thing you want to do is leave them behind if there is an emergency. If you don't have a plan for your pets, please create one. Pledge to not leave your pet behind at aspca.org/disasterprep Our pets rely on us to take care of them, so let's do all we can. Here's some simple steps to be prepared for natural disaster so you can save your pets lives and your own. 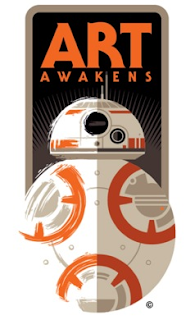 Lucas Films and HP Join Forces To Celebrate Star Wars and Art with Art Awakens! If you have a Star Wars fan that is also an artist, you are going to love this. This is where Star Wars, art and the forces for good all come together! I finally tried a cronut! The best girls in the world! 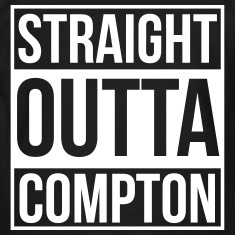 When I went to see Straight Outta Compton, the new movie about Rap group NWA, I knew it would be an interesting piece of music history, but I had no idea how exciting and motivating it would be. This is not just a movie about rap, this is a movie about perseverance. Even if you're not a fan of "Gangsta Rap", you can still enjoy this movie. First, let me tell you that Straight Outta Compton is 147 minutes long, that's right almost 2 and a half hours, but... it doesn't feel like it at all! When it ended I was really disappointed that it was over. Now, that could be the nerd in me that needed to know more about Dr. Dre and the rest of NWA, because I certainly went home and did more research, but even my husband said that it didn't seem like that long. It moves fast through the rise of NWA, the challenges they faced, and ultimately ends with Dr. Dre walking away from Death Row records. It is a movie full of drama, and of course hard hitting beats, and I loved it! Can you believe it's Back to School time already?! It seems like Summer just started! Now it's time for all the excitement of new clothes, school supplies, and lunchboxes. But have you thought about what snacks you're going to put into those lunchboxes? School days can be long and we all need energy to get through them so we need snacks and fun treats. 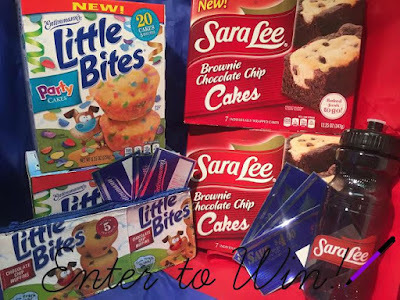 Sara Lee Snacks and Entenmann's Little Bites are perfect for this. Get some tips on Back to School and enter to win in this awesome Back to School Giveaway! KidzVuz had a Back to School event last month in NYC. It was alot of fun, especially meeting this awesome Diva. She was super sweet! Hubby didn't get to go, so she autographed a picture for him. Our family loves to play board games, but sometimes we just get so busy, we aren't always together long enough to sit down and play a game. Since we were all together this weekend to celebrate my youngest daughter's birthday, it was a great time to try out a new game that I got in my Sweet Suite box. We played Riddle Cube the Game from Educational Insights, and we had some good laughs. Riddle Cube the Game is a race to see who can create a shape with their "riddle cube" the fastest. If you're looking for an interactive game for the whole family, or you want something that your child can use to develop creative skills and hand eye coordination, Riddle Cube may be the perfect thing for you. I absolutely love coconut! So when I saw a recipe for Blueberry Coconut Muffins on my package of unsweetened coconut flakes, I got super excited. Not because I wanted to make that recipe exactly, but because it gave me an idea for another kind of Coconut muffin...Banana Coconut Muffins! Now, doesn't that just sound yummy?! Oh, they were!! And, you know what?! They were even better!